A position of the fetus in which the feet or the buttocks present first during birth. What do you feel when you hear the word breech? Scared? Empowered? Defeated? Or maybe this is the first time you’re hearing it. This word can bring up some many different emotions for parents. Maybe you had a breech baby vaginally and it was the most empowering moment of your life, maybe you had to have a caesarean section because the doctor didn’t think it was a safe option to deliver naturally, maybe you opted for a caesarean and you feel confident that you made the right decision for your baby, or maybe you tried everything to get your baby to turn and it worked! Or maybe it didn’t work. There’s so many different scenarios when we talk about breech. 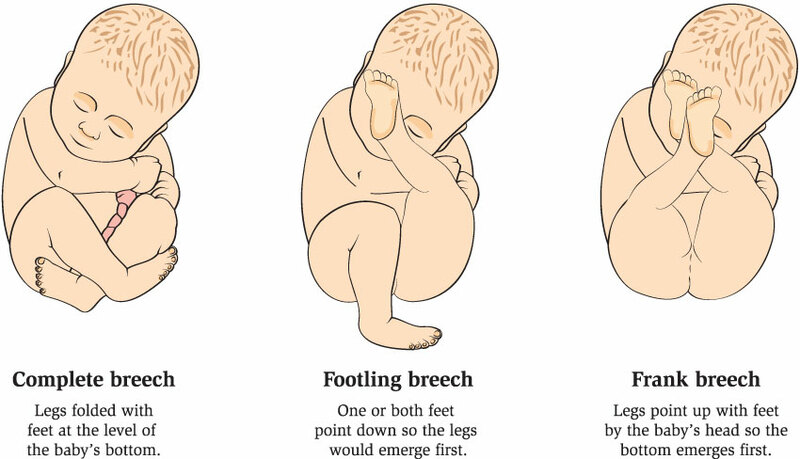 When we talk about breech presentation, it’s important to note that there are a few different variations of breech. Complete Breech. In this position, Baby is sitting with its bum on your cervix, and legs criss-crossed in front of them and feet down by the bum. Then we have Frank Breech. In this presentation baby has his legs straight out in front of him and his feet up by his ears/head. Quite literally folded right in half. The last one is Footling Breech. A footling babe has either both feet or just one foot down by the cervix, instead of the bum. Babies feet would be delivered first in this situation. In the area we live in, we are fortunate that we have doctors and midwives who are comfortable with delivering breech babies the old fashioned way, with the exception of footling breech. When a baby is delivered feet first, the risk of cord prolapse is just too high for doctors to feel comfortable delivering naturally in that situation. If your baby is healthy and there are no other risk factors, your chances of delivering a breech baby vaginally are good. Of course, it would be the best situation if baby would turn before the birth. So, what do you do if you find out that baby is breech? There are many things you can try to get your baby into the desired head down position. Chiropractor: Seeing a chiropractor can be beneficial in getting your pelvis aligned and into a good position therefore making it more desirable for baby to get head down. It also loosens up the muscles and ligaments around the uterus, making everything a little more “loosy goosey” for baby to be able to flip on its own. The chiropractic technique that is the best known for helping flip babies is called the Webster Method. Make sure you look for a chiropractor in your area that is certified to preform this method. Acupuncture originated in China but has since become widely practiced in the western world as well. It involves pricking the skin with tiny needles in certain areas over the body, to alleviate pain, ease mental distress or in this case, get baby into an ideal position for birth. Moxibustion is a herb that when burnt and held next to the side of the pinky toe (the acupuncture site for the bladder) can be useful in turning a baby. The warmth from the burning herb is the key with the moxibustion so it should be held close enough to the toe to feel heat, but far enough away that it doesn’t burn the skin. Although western medicine can’t explain why acupuncture and moxibustion work for turning a baby, an Italian study done in 1998 by Cardini & Weixin found that 75% of breech babies turned when the procedure was performed between 33 and 36 weeks gestation. With these results, it’s certainly something to look into. A google search for turning breech babies will bring up a spinning babies page, without fail. The basis of spinning babies is manipulating the pregnant woman’s body into positions that encourage baby to flip. These techniques are free, can be done at home and are easy to do, for the most part. The most common positions for breech babies are the Breech Tilt, which involves propping a plank of wood or an ironing board against a couch. The mother then lays down on the propped up board upside down with her feet at the top of the board. This position works using gravity and balance. The other popular spinning babies technique for breech babies is the Forward Leaning Inversion. In this position the mother positions herself with knees on the edge of the couch and slowly and carefully lowers her hands onto the ground. Both of these positions enable the baby’s bum to come out of the mother’s pelvis gives him/her more room to flip. Check the spinning babies website for more info. Or ECV is a technique performed by a trained doctor. The doctor manually turns the baby from the outside, using his hands. The procedure is usually done with the use of an ultrasound machine to make sure baby stays healthy during the procedure. ECVs have about a 50% success rate (some studies state higher or lower success rates) and are quite painful for the mother and even if the baby turns, there’s a high chance that the baby will turn back to a breech presentation. This one is a little more invasive than other techniques and parents should do their own research to decide if it is right for them. Swimming can be another non invasive way to try and get baby to turn naturally. You can try somersaults and handstands in the pool to use gravity to your advantage. Music: Putting ear buds on your lower abdomen is said to make baby want to hear the music better and dance down into a head down position. Again, no real evidence for this one, but might be a fun and easy trick to try. Some people believe that getting in touch with yourself and your baby through guided meditation pr hypnotherapy can help you to discover why the baby isn’t turning. Having this information could either help you to fix the problem, or to begin to have peace about the possibility of a breech birth should the problem not be something that is “fixable”. Hypnobirthing Australia offers a guided meditation for breech babies that is very relaxing and beneficial. Whether or not your baby flips, you can still have a peaceful, loving birth that you have control over. If a planned caesarean is something that is inevitably in your breech birth plan, research family centred C-sections. There are a lot of things you can do to make your c section into a birth that you feel confident and good about. Advocate for yourself and don’t be afraid to listen to your body and your baby. You got this, Mama.